AP Inter Exams 2019 Hall tickets /First, Second year inter hall tickets @jnanabhumi.ap.gov.in: AP inter hall tickets 2019, AP IPE March 2019 exams hall tickets, BIEAP Inter first year hall tickets, BIE AP Inter second year hall tickets, bieap.gov.in inter hall tickets: The AP State Board of Intermediate Education, Hyderabad has issued the IPE inter first and year march 2019 annual exams time table. The Intermediate Public Examinations March 2019 are scheduled to be held in March first week, 2019. The hall tickets would be dispatched to all the junior colleges in the state from bieap office. So, all type of Junior College Managements / Principals would give Hall tickets to the students. Every year as many as 7 lakh students appear for the Intermediate Examination from thousands of Junior colleges. There are different stream or commonly called as groups in the Intermediate course like M.P.C, Bi.P.C, M.E.C, C.E.C, H.E.C etc. Based upon their interest the students can choose any stream. Exams for all the streams will commence from the same date though the examination paper will differ based upon the stream chosen. BIEAP has released the official Time table for both 1st year & 2nd Year Intermediate students on. The exams will commence from 27th of February, 2019 and last till 17th March, 2019. AP Intermediate 2nd Year Students will also have Practical Examinations before the main Board Exams which will commence from 1st February, 2019 and will last till 21st February, 2019. The Hall ticket for both Practical & descriptive exams will be same. As the Practical Exams will commence from 1st of February itself the Hall tickets are likely to release in this week itself. The Board of Intermediate Education, Andhra Pradesh has announced the Intermediate examinations time table for the year 2019. The Board of Intermediate Examination has clearly indicated that the students of the entire state may have to follow the same methodology that has been enforced till now for the next year as well. 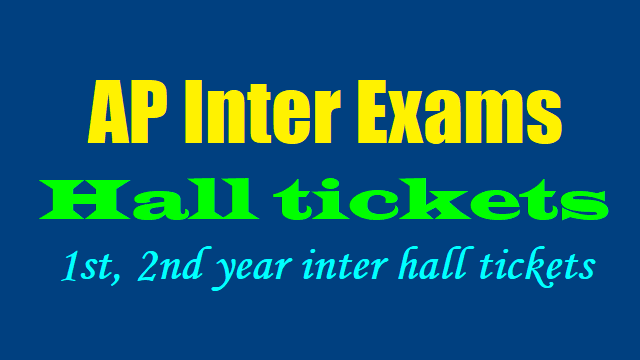 AP Inter 1st Year and 2nd Year Hall Tickets: AP Inter 1st & 2nd Year Hall Tickets 2019 available to Download at bieap.cgg.gov.in ; https://jnanabhumi.ap.gov.in/ Inter Students can Get I.P.E. First and second Year Hall Tickets Here. Andhra Pradesh Board of Intermediate Education (BIEAP) is in full readiness to conduct intermediate 1st and 2nd year board exams for the eligible students of the state in the month of March. The board will conduct the exams very prestigious for which lakhs of students will appear. The enrollment for the exam has been completed successfully and all the students are getting ready to take up the exams. As the exams are nearby all the students have been waiting for the release of hall tickets. BSEAP has announced that it will make the inter first and Second year exams hall tickets in its official website from 22nd February 2019. AP Intermediate 1st & 2nd Year Hall Tickets 2019 Download @ bieap.cgg.gov.in, Students of inter 1st and 2nd year can go visit the official website of BIEAP and download their admit cards. Students need to be aware of the fact that the hall tickets will only be held for download in the official website of BIEAP. The official website of the board to download hall tickets is bieap.gov.in. Download AP Inter 1st and 2nd Year Hall Tickets IPE Hall tickets: BIEAP will conduct the inter 1st and 2nd year exams for the students in March and students will be able to download the hall ticket from the official website of the board. Hall ticket is a very important document and all the students must and should carry them to the exam hall without miss. The hall tickets will contain info like name of the candidate, roll number, guardians’ names, exam names, exam dates, exam venue etc. So, students are advised to download the hall tickets as soon as they are uploaded in the official website of the board. The Andhra Pradesh First & Second Year hall tickets Mach 2019 will only be available for download in the official website of the board. How to Get Andhra Pradesh inter 1st and 2nd year hall tickets March 2019? Go and visit the official website of AP intermediate board i.e., bieap.gov.in. In the official website, click on the AP inter 1st and 2nd year hall tickets. The link will direct you to a new page where you need to select your year and enter your details like registration number and date of birth. After entering the details submit the page and you will see your hall ticket on the display. Check all the details and take a printout of it. Keep the hall ticket safe and make sure to carry it to the exam hall. AP Inter 1st and 2nd Year Results Release Date BIEAP will conduct the inter 1st and 2nd-year exams for the students in March and students will be able to download the results in the month of May. BIEAP will release the results of inter 1st and 2nd-year exams in the month of May as it does every year. Students need to keep in touch with the official website of BIEAP to check the results as soon as they are announced. The results will most likely be released on April this year. Students can fetch their results easily by visiting the official website of AP intermediate board with the help of their roll number and date of birth. The results of inter 1st and 2nd year will be out in April last week. The first year theory examinations will commence from 28-02-2019 and second year examinations commence from March first week, 2019. All examinations will be held from 9.00 A M to 12.00 Noon. AP BIEAP Inter 1st, 2nd year exams 2019 Hall tickets to be released at bieap.gov.in: BIEAP hall tickets 2019: The hall tickets for Andhra Pradesh first and second year intermediate vocational courses examinations will be shortly released. All those students who would be appearing for the same are required to download it from the official website - bieap.gov.in - once it is released. The exams for the first year will begin from February 27 and for the second year from 28th of February, 2019. At present, the practical exams are being carried out for general intermediate courses. They will end on February 21. For Intermediate 2nd year students, while applying for entrance exams the Intermediate Hall ticket number is mandatory. About AP Inter Exams: Every year as many as 7 lakh students appear for the Intermediate Examination from thousands of Junior colleges. There are different streams or commonly called as groups in the Intermediate course like M.P.C, Bi.P.C, M.E.C, C.E.C, H.E.C etc. Based upon their interest the students can choose any stream. Exams for all the streams will commence from the same date though the examination paper will different based upon the stream chosen. BIEAP has released the official Time table for both 1st year & 2nd Year Intermediate students. The exams will commence from 27th of February, 2019 and last till 17th March, 2019.